We have a lot to thank the ’60s for: great music, great hair, great fashion – and, for those of us living in London, great food. 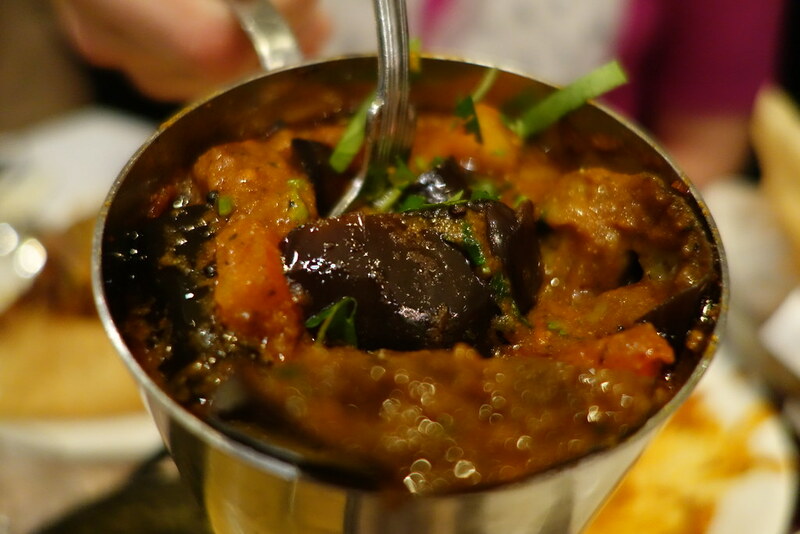 Great North Indian food, to be precise, as 1966 was the year Gaylord opened their doors on Mortimer Street. 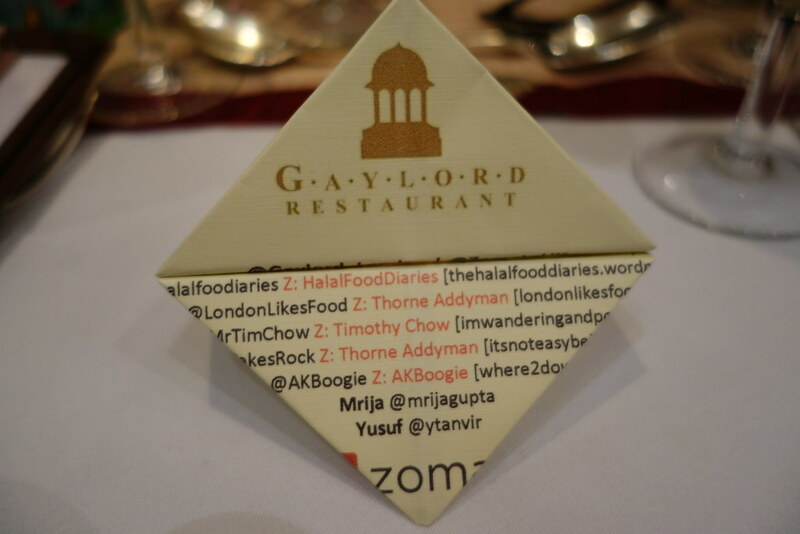 Last Tuesday, twenty-one food bloggers descended on Fitzrovia to sample the award-winning fare and the famous butter chicken at Gaylord, courtesy of Zomato. Zomato is my go-to app for restaurant reviews, suggestions for local restaurants when I’m out and about (I’m constantly bookmarking places I plan on going to next) and is great for booking tables too. The decor in Gaylord is elegant and understated, if a little dated – but with a restaurant philosophy of ‘tradition is always in’, it’s more than a little expected. It’s probably a little fancier and a bit more upscale than the usual central London Indian establishment, and in such a great location too. I hadn’t quite prepared for the colossal tidal wave of food that awaited us at Gaylord – we counted 24 courses in total. We spent the first two hours on canapés, cocktails and starters alone, in the four happiest and most delicious hours I’d spent all week! The canapés followed in rapid succession; each more beautiful than the last. The presentation of all the food at Gaylord was simply stunning. 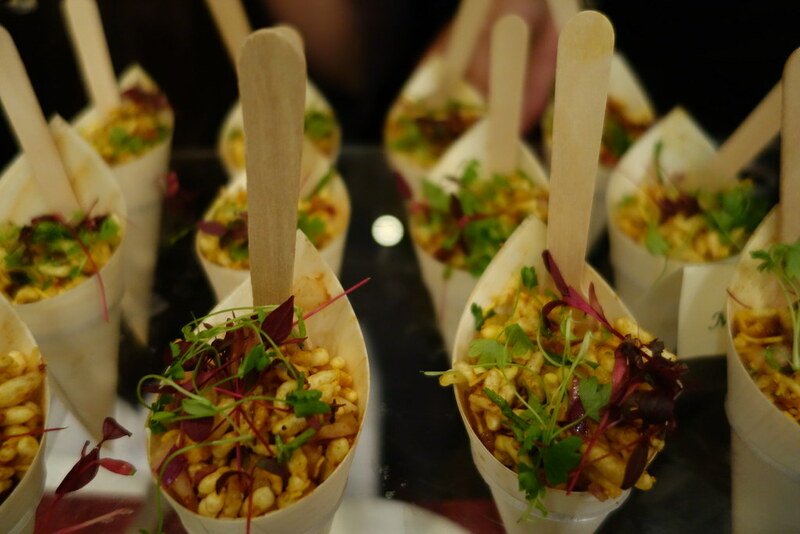 First to arrive were the mini bhel puri cones – spiced cones filled with puffed rice, onions and a tamarind sauce. Although I enjoyed the light and crunchy texture, the dish itself was bland and not particularly memorable. 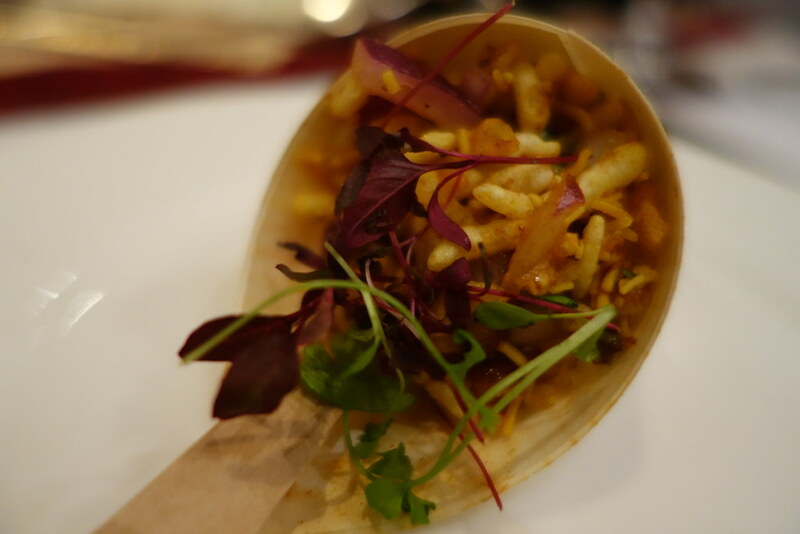 The bhel puri cones were followed by the aloo tokri chhat, which were described to us as ‘little potato cupcakes’, but more closely resembled spiced hash browns. They were not only beautiful but delicious too, buttery crisp on the outside and fluffy and soft within. Our potato cupcake was followed by murg malai tikka and zaffrani chicken tikka, succulent pieces of chicken delicately marinated in a light cheese sauce which were perfectly complemented by the spicy chutneys and pickles. 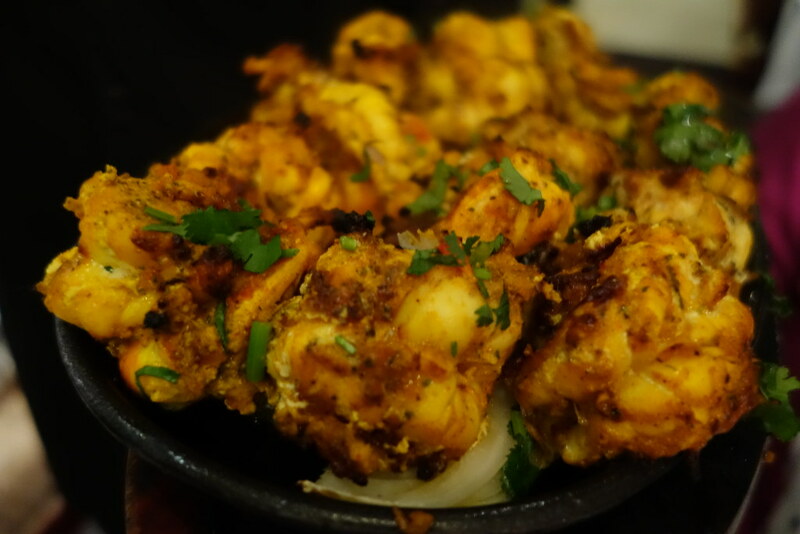 We rounded off the canapes with gigantic, juicy chargrilled tiger prawns, that had been marinaded in saffron and tandoori masala. 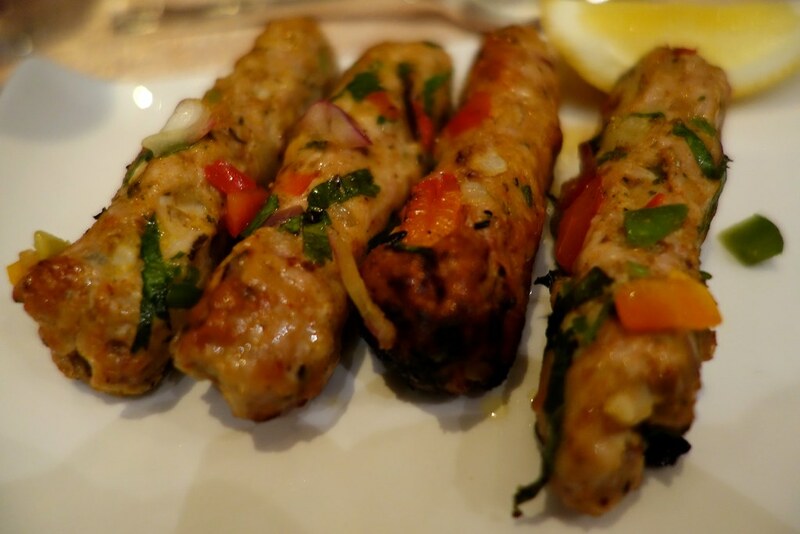 Our first starter arrived in the form of the murg gilafi seekh, a clove smoked minced chicken skewer which was chargrilled and layered with bell pepper. These were spiced beautifully, and were delicious with the addition of lemon juice, the peppers providing depth to the heat in the chicken skewers. 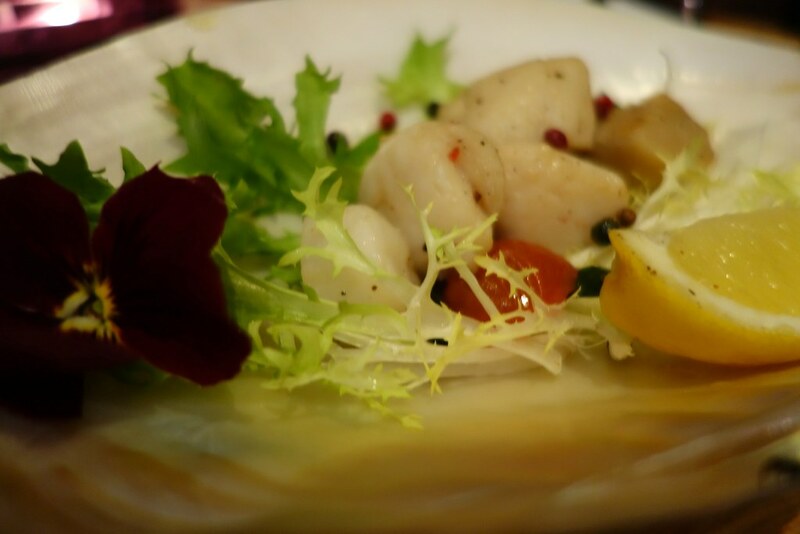 I had been really excited about the Andhra scallops, which claimed to be seasoned with crushed black pepper, curry leaves, cherry tomatoes and pink peppercorns. 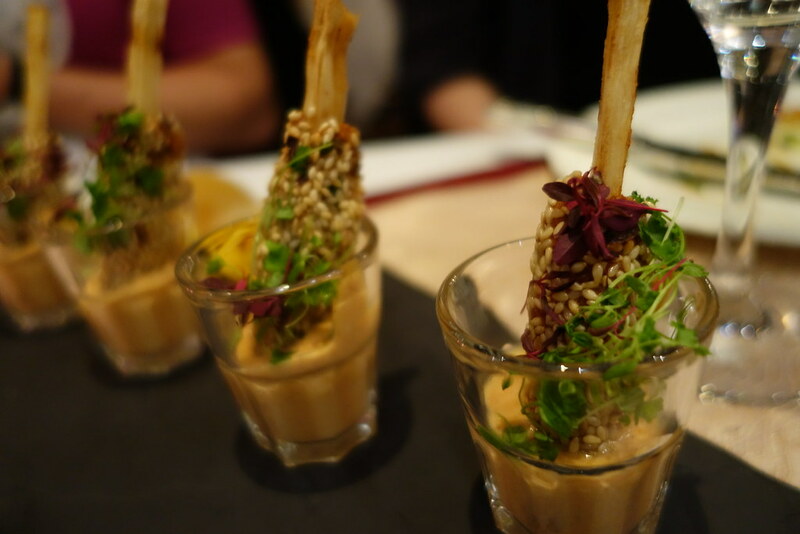 They were nice to look at, but tasted completely bland, even with the addition of the sauce – I wouldn’t personally order these again, especially when the other starter options are so delicious. 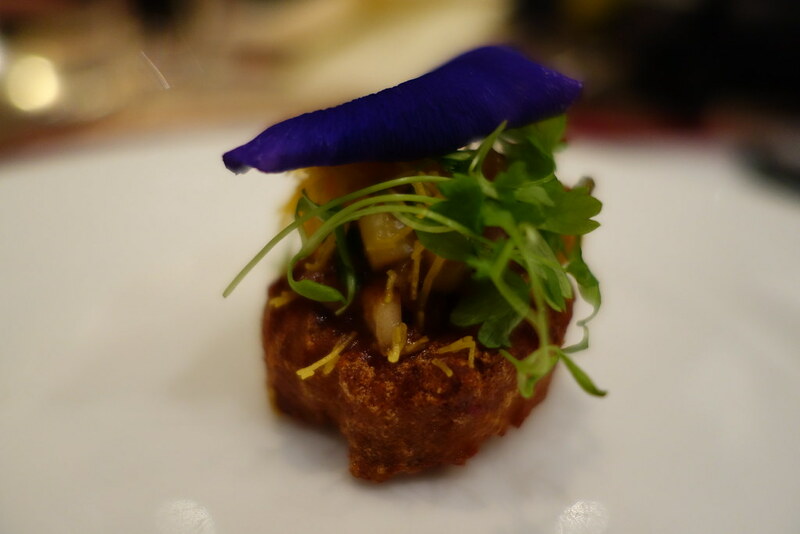 The arrival of the crab cakes dakshini sparked a cacophony of excited squeals and camera shutter sounds from our table – they were pretty stunning. 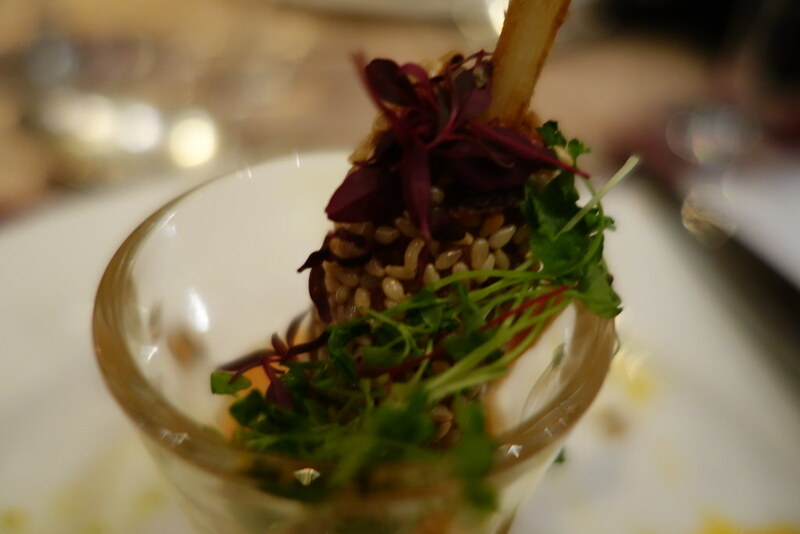 A combination of curry leaves, southern spices, mustard cress and sesame seeds, these crab cakes came served on the end of a sugar cane stick, and were really unusual. I enjoyed the creamy sauce that accompanied this starter in particular. 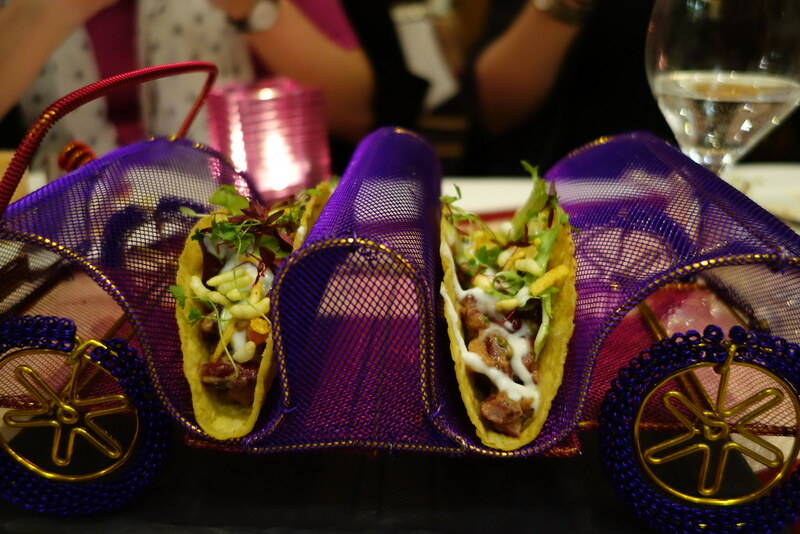 The tacos arrived fairly stylishly – in their own car, no less. The lamb seekh kebab and red kidney bean tacos were an unexpected fusion twist, a strange deviation on the menu, particularly from such a traditional restaurant. 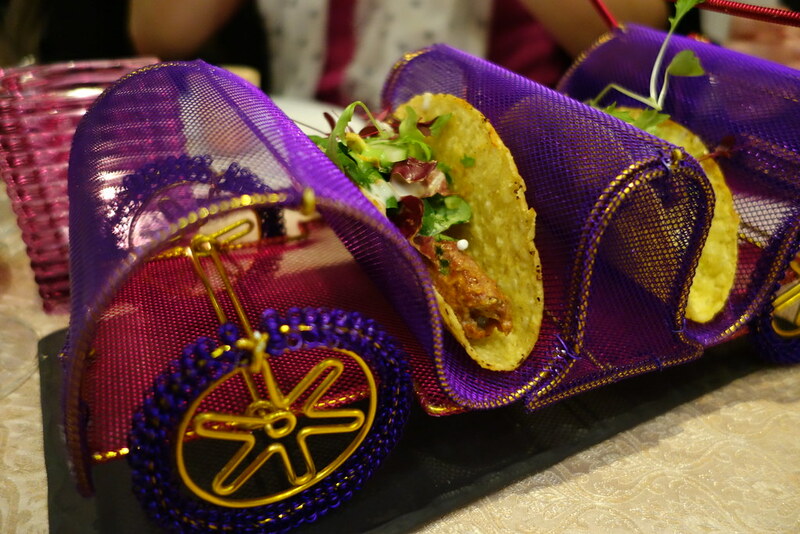 The Indo-Mexican tacos were incredibly moreish, however, and surprisingly light, too. After the tacos sped away, we finally moved onto our mains: lamb chops anardana, chargrilled chops with a spicy ginger infusion and pomegranate seeds, prawn coconut curry with kaffir lime and the famous Gaylord butter chicken, made with tandoori chicken strips in a Makhani sauce. The Gaylord butter chicken was my favourite by far, with the chops coming in at a close second. 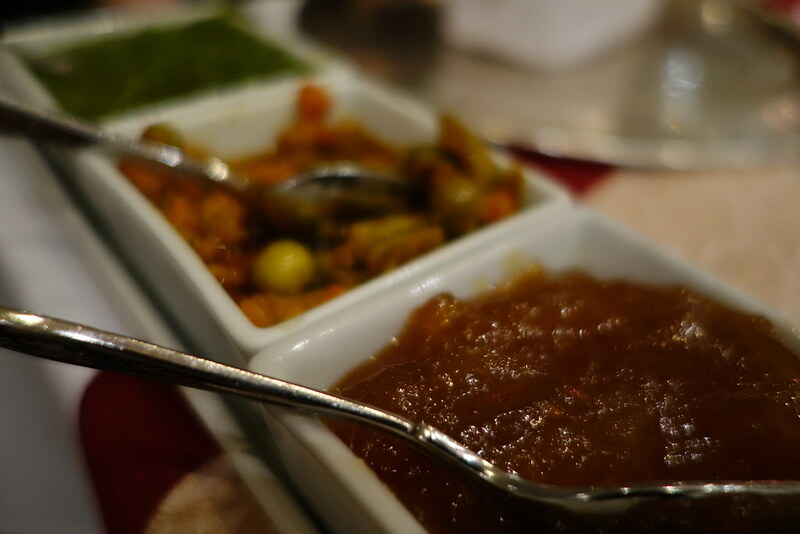 These were accompanied by sides of chana peshwari (chickpeas in Gaylord’s signature secret spice mix), dal bukhara lentils, baingan hyderabadi (aubergine in spicy masala gravy) and zaafran basmati rice with anar and cucumber raita. Gaylord’s butter chicken offering was spicier than your average butter chicken, thanks to the tandoori marinated chicken pieces within the rich, creamy sauce. Combined with the chutneys and the dal bukhara, in my opinion this dish made other butter chickens pale in comparison. At this point in the evening I was seriously concerned about how I was going to manage to make it home without assistance. The team at Gaylord had no mercy, and yet another wave of courses came our way – thankfully, it was dessert. I’m pretty particular about desserts, and while the mains were absolutely delicious to say I wasn’t blown away by any of the dessert offerings at Gaylord would be an understatement. Rasmalai, an Indian soft cheesecake in cardamom-scented sweetened milk sounded divine, but the texture really didn’t agree with me, although I did enjoy the flavour. If you are a fan of trifle, then this ‘wet cake’ trend and texture that seems to be so prevalent in British desserts might be for you; it certainly wasn’t for me. 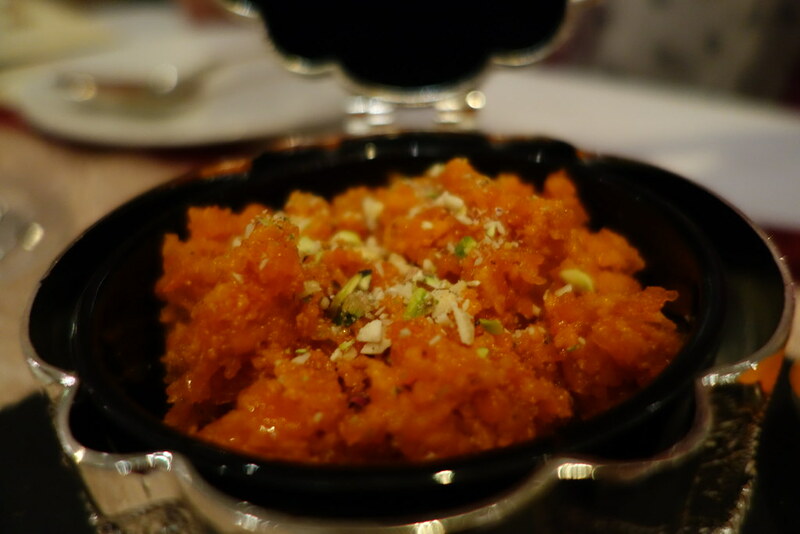 The gajar halwa certainly exceeded my expectations and left me pleasantly surprised, although this grated carrot and pistachio based dessert was so rich and sweet that I wasn’t able to have more than a teaspoon, particularly after such an epic feast. 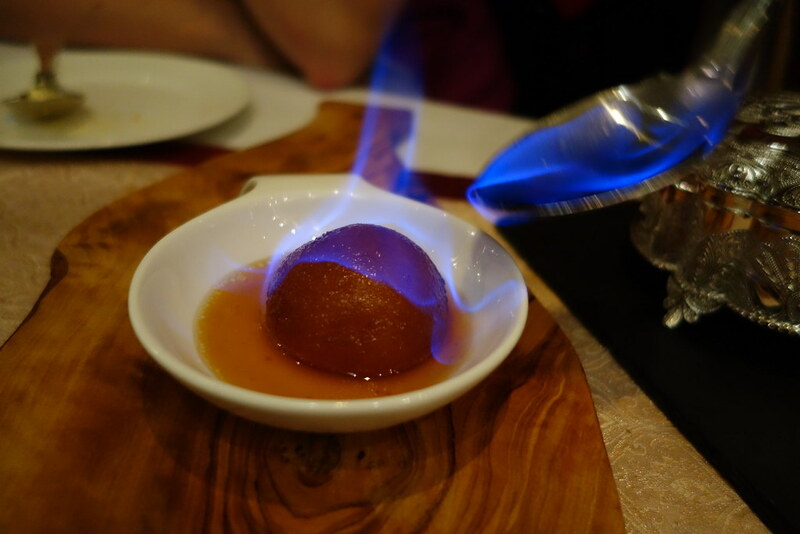 The absolute pungency and alcohol level of the gulab jamun can absolutely be attributed to me, as I had left the table and missed the flambee, and more rum was needed to get this shot! My lovely dinner companions (Katy and Tracy, after Nicola’s pre-dessert departure) couldn’t manage more than a few bites of the sponge due to concerns about making it into work the next day – it was eyewateringly strong. But again, as someone who is not at all a fan of wet cake, this didn’t appeal to me whatsoever. All in all, I had a veritable feast at Gaylord – the starters and mains were delicious, and got 5 out of 5 from me in terms of presentation. The staff are so accommodating and lovely, and though I wasn’t a fan of the desserts the lentils and butter chicken more than made up for it. 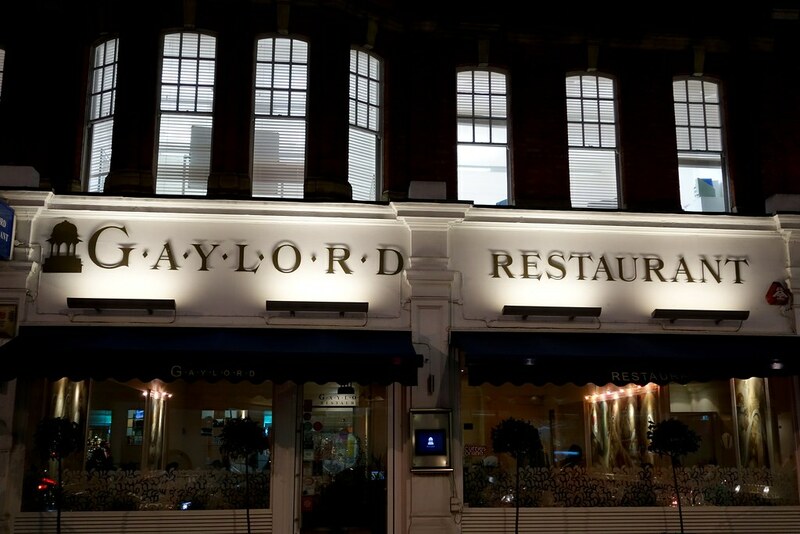 Gaylord is located at 79-81 Mortimer Street, London, W1W 7SJ, 02075803615.